John Hills’s acclaimed book Good Times, Bad Times: The Welfare Myth of Them and Us rests on a simple but seldom-made observation: much of the redistribution carried out by the British welfare state involves shifting resources from working-age adults to retirees, pensioners and people with higher-than-average healthcare and aged care needs. Or, to put it another way, the system moves resources from one point in people’s lives to another, rather than from one class to another. Australia’s welfare system follows broadly the same pattern, though demography and the design of our system mean that we redistribute more from rich to poor and less across the life course than does Britain, or any other OECD country. Partly, this reflects our younger population; partly, it’s because we demand less tax from older people. In both countries, many people call on government support at some time during their working lives – because they become unemployed, ill or disabled, for instance, or because they face extra child-rearing demands after a breakdown of family relationships. Even in Australia, which has the most income-tested system of any rich country, nearly two-thirds of working-age households receive an income-tested benefit during any ten-year period, yet only around 1 per cent of households depend on benefits across a full decade. Conventional point-in-time analyses of who receives benefits and who pays taxes don’t reveal the fact that many more people benefit from social spending than is commonly understood, or that low-income groups contribute much more in taxation than shows up in a single-year survey. still assumes that we can be divided neatly between those who pay in, and those who take out. Allied with the escalating stigma attached to those who are at any one moment receiving benefits and the notion that a large share of public spending goes on people who are out of work, this makes further savings from “welfare cuts” sound attractive – and politically costless, since those affected will be “them” rather than the “us” voters are assumed to be. This theme – of a divided “them” and “us” – runs across a hundred tabloid front pages and through a dozen TV programs focused on an assumed unchanging “welfare-dependent” underclass. Change the terminology, and some of this sounds uncannily familiar to Australian readers. But to what extent have these and other welfare myths really taken hold in Australia? Hills’s first set of myths relates to the question of who actually receives welfare payments. In a 2012 British survey, people were asked what proportion of the national welfare budget was spent on benefits for unemployed people. Half of the respondents thought unemployed people received 40 per cent or more of spending, and a quarter thought they received more than 60 per cent; the average response was 41 per cent. The real figure was 4 per cent. In Australia, the real figure is slightly higher, at 4.9 per cent. A 2016 survey by the ANU Centre for Social Research and Methods asked respondents which area of social welfare spending was largest. Forty-five per cent of respondents said payments to the unemployed, which was in fact the second-smallest of the five programs mentioned. Only 22 per cent of respondents thought that age pension spending was highest, yet this form of income support is by far the most significant – $41.6 billion in 2014–15 compared to $10.8 billion for jobseekers. In the British case, Hills points out, the belief that a high proportion of the money goes to the unemployed sits alongside a belief in widespread fraud. The Department for Work and Pensions estimates that just 0.7 per cent of all British benefits (including pensions) are overpaid as the result of fraud. For Jobseeker’s Allowance, cases of fraud make up an estimated 2.9 per cent. But when people were asked what proportion of benefits and tax credits was claimed fraudulently, the average response was 27 per cent, nearly fifty times the grossed-up result from the department’s random checks. A quarter of respondents put the figure at 40 per cent or more. 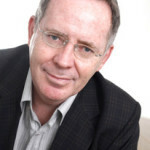 In Australia, Griffith University’s Tim Prenzler has analysed the results of Centrelink fraud and overpayment investigations between 2006–07 and 2008–09. Unlike its British counterpart, Centrelink doesn’t directly provide estimates of fraud but reports on detected errors and fraud prosecution actions and outcomes, usually initiated through compliance and eligibility reviews. In each of the three years, Centrelink initiated close to four million reviews. Around 15.7 per cent of reviews led to cancellations or reductions in payment, but only 0.8 per cent were referred to the Director of Public Prosecutions, and 0.5 per cent were prosecuted. Overall, 0.04 per cent of customers were convicted of fraud over the three years. Over the three years, fraud investigations were estimated to have produced $380.6 million in gross savings and amounts targeted for recovery, out of the $200 billion–plus spent through Centrelink. In other words, savings from detected fraud added up to less than one-fifth of 1 per cent of all spending over the three years. Despite the evidence that deliberate fraud is a tiny fraction of social security spending, it remains a mainstay of much reporting of welfare in the Australian media. The Daily Telegraph is a repeat offender. In May 2014, it reported an (unsourced) estimate that one million people could be receiving the disability support pension, or DSP, by 2017. In September of that year, it claimed that “an army of bludgers are using online step-by-step guides to con doctors into giving them disability support pensions.” In December 2014, it described the recipients targeted by new medical requirements for DSP as “rorters” and reported that the Department of Human Services had “investigated 411 people for dishonestly claiming the DSP, saving the taxpayer a whopping $9.5 million” in the previous financial year. While that article did mention that a total of $16 billion had been paid to DSP recipients during the year, it failed to divide the dishonestly claimed amounts into the total figure. What that calculation reveals is that fraud accounted for just one-sixteenth of 1 per cent of spending, and the number of people investigated was about one-twentieth of 1 per cent of recipients. It’s war: the Daily Telegraph’s campaign opens up a new front. Statistically, this is like comparing apples with pineapples. The population of Australia has grown so much in the intervening years that New South Wales (7.5 million) is now very similar in size to the total Australian population at the time of the second world war (7.4 million), so any comparison needs to build in a factor of more than three. 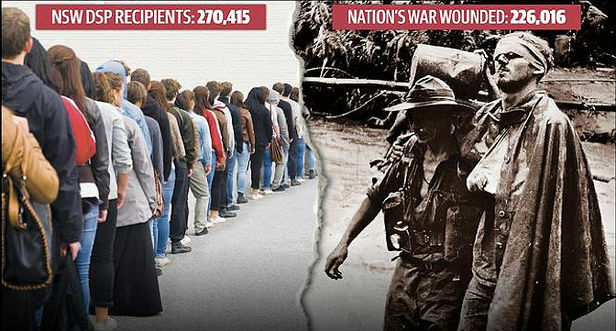 Comparing a group of people aged between sixteen and sixty-five who have been granted payments over an extended period, potentially decades, with a group of generally young people injured in around six years of war is quite a stretch, and the report didn’t point out that roughly 40 per cent of DSP recipients are women, whereas very few of Australia’s war wounded were. On the same day, the paper published an editorial headlined “We Need a NEET and Tidy Solution to these Bludgers,” again with photographs of the two young women. The next morning, the two girls made it onto Seven’s Sunrise and Nine’s Today Extra, and that evening they were also on Seven’s evening news and Nine’s A Current Affair. Treasurer Scott Morrison said in a radio interview a few days later that he would ask the social services minister to look into the NEET duo’s welfare status. The story was contested by the online news site the New Daily, which put Australia’s youth unemployment figures into international context. The NEET rate in Australia is about two-thirds of the OECD average and the share of young people in jobs has been consistently above the OECD average for the past thirty years. It also sought to explain the factors behind the NEET status, including longstanding educational disadvantage. Complicating the issues was the fact that the younger woman turned out not to qualify as NEET. She was not only still at school but also working part-time, and wasn’t receiving a Centrelink payment. According to her father, she was simply “acting up” during the interview. He told the Guardian that she had taken the negative attention very badly, and her mother was organising counselling. While not as consistent as the Daily Telegraph, the Adelaide Advertiser has taken similar lines in its coverage. In January 2013, under the heading “Single-Parent Women Most Likely to Cheat,” it reported that “South Australian welfare recipients have ripped off nearly $80 million from Centrelink in the past financial year and most of the fraudsters are women.” After the article appeared, the federal Department of Human Services (which had supplied some data to the paper) told the publication that fraud-related debt in South Australia in the past year had been about $2.5 million, not $78 million. That article also attracted an unfavourable Press Council adjudication. The inaccuracies aren’t always the work of media outlets. In May 2014, the Australian ran a front-page story, “The Single Mum on $55,000 in Pensions, Benefits and Study Aid,” quoting treasurer Joe Hockey’s response to complaints about the 2014 budget’s treatment of single mothers. The treasurer’s office had estimated that she would receive $54,417 in government payments, including the parenting payment, both forms of family tax benefit, several supplements, rent assistance and education supplements. According to the 2014–15 budget papers, spending on the program was $117.25 million spread across just over 33,000 families with 51,000 children. The average level of assistance per family was therefore around $3500, which means that the treasurer’s “welfare mum” would be receiving more than four times the average payment per family and three times the average for two children. Such a family might exist, but would hardly be representative of lone parents on welfare. Again in 2016, and again on the front page of the Australian, another article argued that the welfare system was flawed because “thousands of parents claiming government benefits are financially better off not getting a job.” As evidence, the article gave the example of a person who, despite not working, would receive $52,523 in government payments, considerably more than the $49,831 brought home by the median full-time worker. As Greg Jericho pointed out in the Guardian, the paper’s example was a single parent with four children aged four, seven, ten and thirteen who received neither any employment income nor any child support from the father, and who was paying $400 a week in rent. Hardly typical, in other words. According to research by Ben Phillips from the ANU Centre for Social Research and Methods, only 4 per cent of single parents have four or more children, and only about 2.5 per cent would be eligible for all the benefits this family is assumed to receive. Of course, it is also misleading to compare the income of a family with four children to that of a single person because their costs of living would be much higher. There are, after all, five mouths to feed and five people to clothe, and the family needs larger accommodation. To compare like with like – a lone parent on benefits to a similar size lone parent family in work – we would need to add roughly $23,000 to the disposable income of the median earner, since they would be receiving roughly the same family payments and rental assistance as the out-of-work lone parent. In Britain, the argument that people on benefits should not have higher disposable incomes than people in work has been used to justify the “benefits cap,” which imposes an upper limit on the total amount of benefit income people can receive (unless they are working at least sixteen hours per week). The main groups affected are those with large families or high housing costs, or both. Source: Calculated from Department of Social Services, Income Support Customers: A Statistical Overview (various years), and DSS payment demographic data (various years). 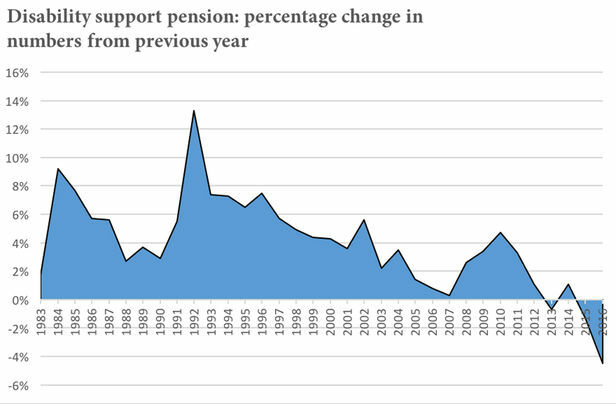 In fact, as the chart shows, the number of people receiving the Disability Support Pension has generally been falling more rapidly than at any time in the past thirty years. Numbers grew by around 5 per cent following the global financial crisis, but the highest rate of growth – 13 per cent in a single year – was between 1991 and 1992. In the first six months of that year, the social security minister was Graham Richardson. How perceptions could be better brought into line with the reality of what is going on is now one of the central challenges facing those making and debating social policies and their future. In a situation where there are rising demands for services from an ageing population on one side and the legacy of crisis meaning tight constraints on resources on the other, we cannot afford to make choices and decisions by myth, rather than in the light of reality. We face some of the same challenges in Australia, though perhaps the choices here are not yet as sharp as they are in Britain. Given our more targeted age pension, we appear better placed than most economically developed countries to meet these challenges, but balancing competing demands will still be a significant challenge. Despite the evidence cited above, it may also be the case that the myths of the welfare state are not as deeply ingrained here as in Britain. The “strivers versus skivers” dichotomy seems to have wider acceptance than the “lifters and leaners” distinction does in Australia – at least if we compare the results of the 2015 British election with the response in Australia to the 2014 budget and the ongoing political controversy since then. 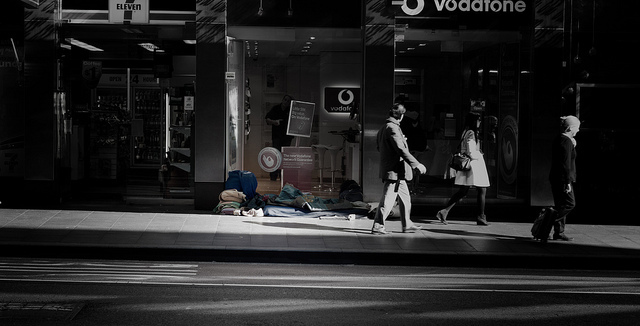 The Melbourne Institute’s 2014 HILDA Statistical Report estimates that just over 80 per cent of the individuals in the survey who were under the age of twenty-five when the HILDA survey began in 2001 received a welfare payment at some stage over the next eleven years – a very large group of “them.” But only 1.5 per cent of this group received more than half of their income from welfare payments for each of the eleven years, and just 0.3 per cent received more than 90 per cent of their income for each of those years. When some news media talk about welfare, they give the impression that “them” are members of a group of people who stay dependent for all of their lives. But this group is tiny – and very disadvantaged. Between the majority who need social security benefits at some time in their lives and the tiny minority who need it all the time lie many complex patterns of social security use reflecting the complexity of people’s lives. Perceptions and analysis of the welfare state do reflect value positions and we should not expect everyone to agree about the directions for reform. But, as in Britain, the evidence that welfare is not simply a matter of “them” versus “us” is overwhelming. Editor’s Note: This article is republished with permission from the Inside Story website. The original article is available here. Hi Peter, The deserving and undeserving poor concept is still with us in 2017 and with this comes the idea of the conniving, lazy welfare cheat who rips off hard working taxpayers. I thought we had put this nonsense to bed in the 1980’s, but like Zombie concepts in Economic theory it keeps rising from the dead. Watching the UK Ken Loach film ‘I Daniel Blake’ made we realise Australia is only one step away from becoming like the UK.